Essentially what we want to do is to use multiple Apple IDs on a particular device, sharing the existing Apple ID for purchases and downloads and creating a separate one for iCloud and other services - fortunately Apple has made it fairly easy to do in iOS 5. Within the Settings app, you can tell various services (e.g. FaceTime) which Apple ID to use - and you can set up a mixture of Apple IDs (although only 1 per service). In actual fact there are 6 services in which a different Apple ID can be used: iCloud, FaceTime, iMessage, iTunes Home Sharing, iTunes (includes App Store and iBookstore) and Game Center. So this means you can use one Apple ID for iCloud, another for iMessage and another for iTunes and so on. 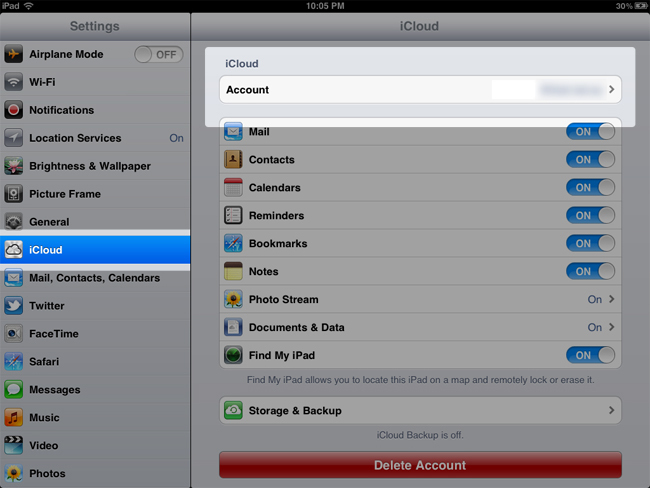 With that said, here are my top recommendations for how to deal with sharing an Apple ID and using iOS 5. This is the most important suggestion I can give you, iCloud includes a number of new services from syncing mail, calendars, contacts, reminders and bookmarks to Photo Stream to storing your documents and data for third party apps. This is my first suggestion because even if you are OK with sharing email and Photo Stream with others, it will become frustrating to see all of your wife's calendar appointments or contacts synced to your iPhone, or when her Pages documents start appearing on your device. Photo Stream must be tied to your iCloud account, which means if you do decide to make it personal, you can't share photos using Photo Stream with others who have a different iCloud Apple ID associated with their devices. For some this might be very frustrating. Only one Apple ID can be used for iCloud, unfortunately this means you can't mix and match iCloud services with different IDs (ie. use Photo Stream with ID #1 and Documents and Data with ID #2). Note there is somewhat of a partial workaround for this which I have described towards the end of this article. I would guess the number 1 reason people currently share an Apple ID is so that they can share Apps, Music, Movies and all the rest of iTunes' content with their family without having to purchase it multiple times. This can continue to happen with iOS 5, and in my opinion it should probably be the only service which you share an Apple ID across everyone in a family. Simply sign into the iTunes Store, App Store or iBookstore on all the iOS devices in your family with this shared Apple ID (preferably the one you have already been using for purchases - otherwise you'll lose your previously purchased content). You can also go to the 'Store' section of the Settings app to ensure the correct Apple ID is being used and to turn Automatic Downloads on. If you are unaware, Automatic Downloads is a new feature that lets you purchase content from one of Apple's stores and have every device automatically download that content, without any syncing or manual action by the user. Automatic downloads can be a little annoying if one family member is downloading lots of games when another family member never plays games - it might be best to turn it off (which you can do on a device-by-device basis), especially for Apps because they will quickly stack up, cluttering your home screen with apps you never wanted. iBookstore can sync bookmarks, and this can also get a little annoying if 2 people are reading the same book on different devices, creating conflicting bookmarks. 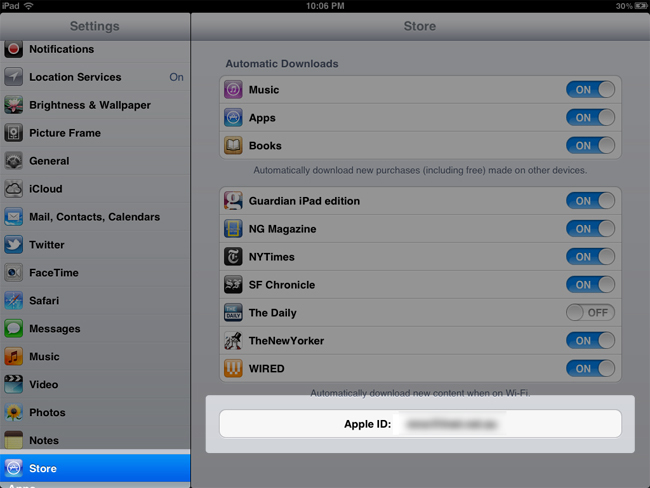 You can turn this option off in the iBooks settings though. From my perspective, the important point to take away with using multiple Apple IDs in a family is to keep the iCloud ID personal, to 1 person only and if you are already sharing an Apple ID for purchases, to keep that shared - so you don't have to repurchase content and don't waste money on multiple purchases. Perhaps use a shared ID if you only use it sparingly with people not in your family (e.g. Having a video call with your parents or cousins). However, remember that if you share the ID, you cannot FaceTime with each other. Probably worth it to just make it separate and save yourself the hassle of changing it in the future if you do decide to FaceTime each other. There is a way to set up iMessage with different addresses but with 1 Apple ID, but it honestly is not worth the effort, when it's probably just easier to use a different ID. Entirely up to your circumstances, if you use it, and how you use it. But by the same token, many probably don't care about Game Center and wouldn't mind if it is shared. At this point you may be a little confused, and wondering where on earth to start and which Apple ID is going to be used for whom and for what device. 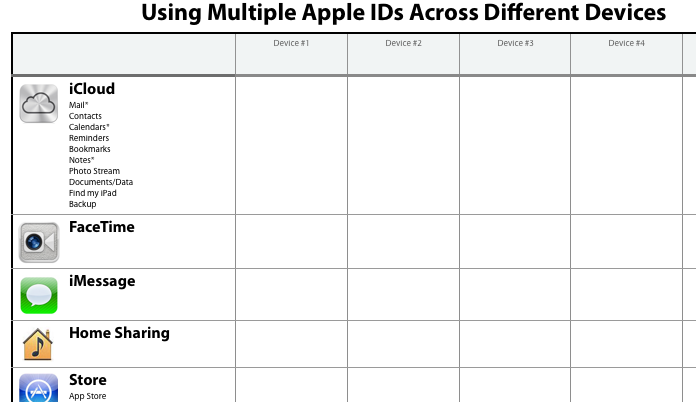 To help you out a little, I've made a simple little template to help you out plan out which ID will be used for what device and for what service. You can download the PDF here and print it out or just annotate it with Preview. If you're feeling a little more adventurous, or need some more flexibility in dealing with Apple IDs, continue reading - but just note that these tips will make your set-up more complicated. I would recommend against these tips unless it really is needed for your situation and would make your life easier in the long term. 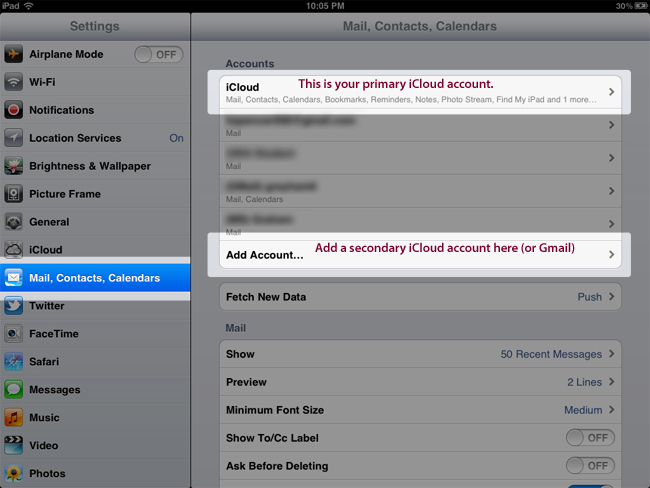 Although the iCloud settings only allow for one Apple ID, if you go to the Mail, Contacts, Calendars page you can add additional iCloud accounts. When set up here as (what I'll call) 'secondary' iCloud accounts, they can be used for Mail, Contacts, Calendars, Reminders, Bookmarks, Notes and Find my iPhone/iPad. As Apple notes on that setup page; "Only your main account can use Photo Stream, Documents & Data and Backup". What this means is you can setup your shared Apple ID with iCloud, create a family email (smithfamily@me.com) that everyone can access, or a family calendar where all events that involve everyone can go - and be synced to everyone. If you or your family is already using Gmail, you can connect to it and use it for Mail, Calendar and Notes sync. If you have been using different Apple IDs for purchases, you can still use both Apple IDs to recover previous purchases - but only using 1 account at a time. My recommendation is to stop that practice and to use just 1 account for all future purchases (remove the credit card details). If you ever need to find a previously purchased app/song, just sign back into that account. In the rule you will want to set “If a message is sent to [insert the family @me.com email] Then forward to [individual email account]” and repeat for each person, changing that forward to address. Now when iCloud receives an email on the family @me.com address, it will forward the email to the personal email accounts you have set up.